I’ve been a Trop fan since the early ’70s, attending Buffett shows and listening to any “beach music” I could find. I’ve been directly affiliated with Trop Rock on Shore Life Radio (www.ShoreLifeRadio.com) since 2008, when I started by administrating the station’s Facebook page. In 2010, I became an on-air personality on “The Shore”. I produce and perform two separate shows. The 1/2 hour Don D’Pyrate’s Daily Show every weekday, presenting unique themes and slants on Trop. 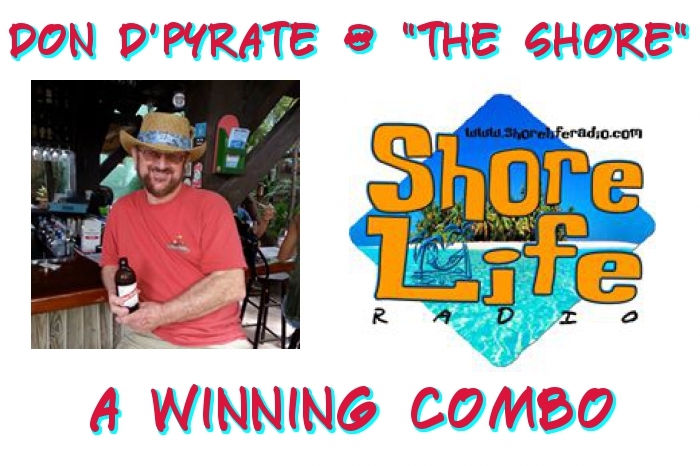 My hour-long Don D’Pyrate Show debuts every Wednesday, and re-boots each weekend, showcasing the best in Trop Rock and Americana music for Shore Life Waders and the world.